Bored to see always the same Ferraris and Lambos going on fire? 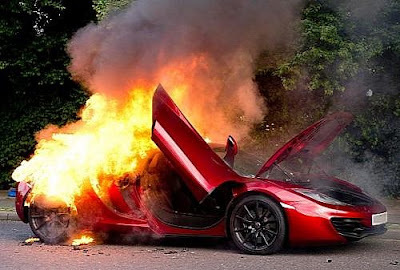 Here we go, today we've learned that even McLarens may turn into a big bonfire. This Volcano Red (even the name of this colour fits with the scene) McLaren 12C caught on fire in London. The driver managed to jump out the car and didn't reported injuries. 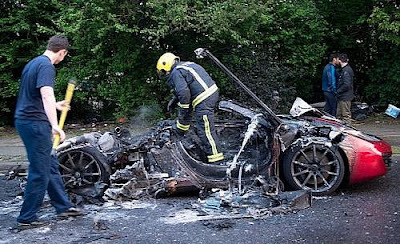 At the contrary for the british supercar, the flames spread out quickly and there's not much we can save from it. What was the cause of the fire? Looks like no Ferrari, Lambo and McLarens for me :( Time to buy a Porsche instead lol. This Aventador sounds absolutely great! Don't mess with the Carrera GT! The most annoying passenger.. ever!